Each handful of wild flower and grass seed mixture is full of potential and diversity: 20,000 or more seeds. Carefully placed in the right conditions this potential can grow. Sow seed mixtures evenly onto the prepared soil surface by hand-broadcasting, seed fiddle, seed/fertilizer distributor or hydraseeding. To get even distribution, and also avoid running out of seed part way through a job, it may help to split the quantity to be sown in half, then sow the entire area twice at half rate. Sow the first half in one direction, and then over-sow the remaining seed in another direction. Any errors in sowing the first half of the seed can be made good when sowing the second half. To help achieve even sowing it may help to bulk the seed with a convenient volume of an inert carrier such as sand, potting compost, sawdust or cornmeal. Do not incorporate the seed by drilling, or rake or harrow after sowing to cover the seed, as most wild seeds are very fine and cannot germinate if buried. 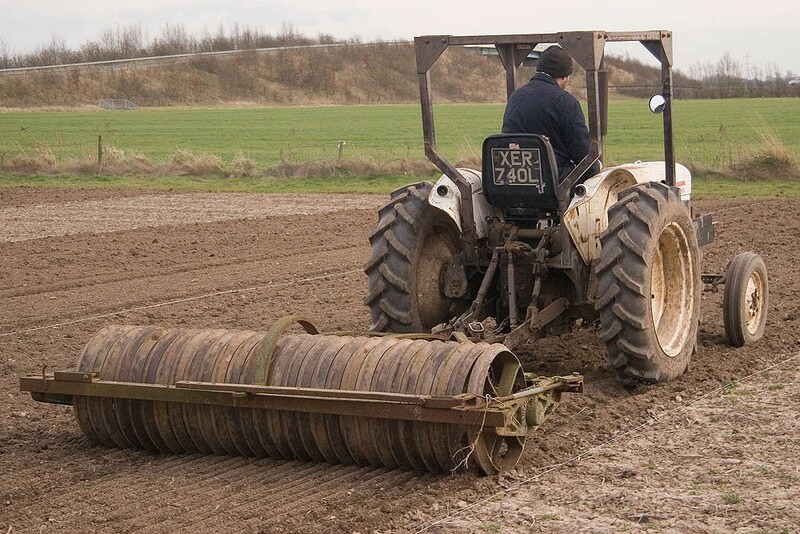 Roll or tread after sowing, particularly in dry weather and with freshly worked loose soil; this will press the seed into contact with the soil and bring moisture to the surface by capillary action. 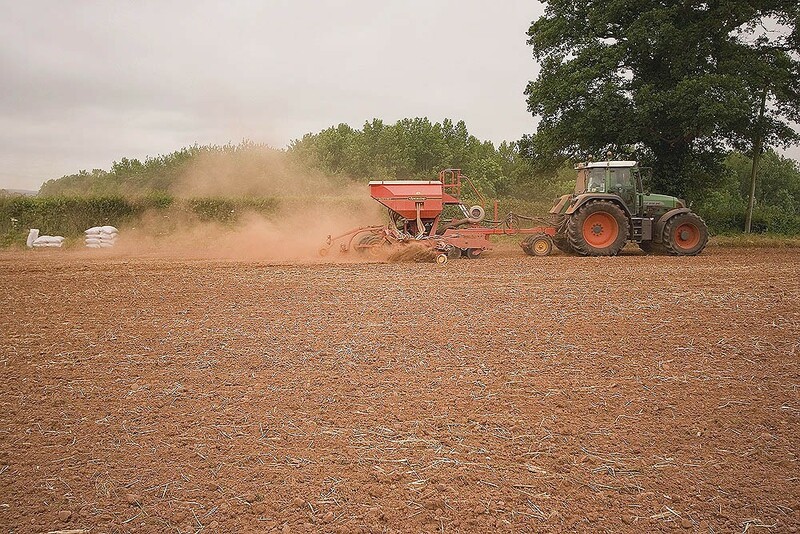 In wet weather a good rain after sowing will wash the seed in and settle the soil surface without needing to roll. 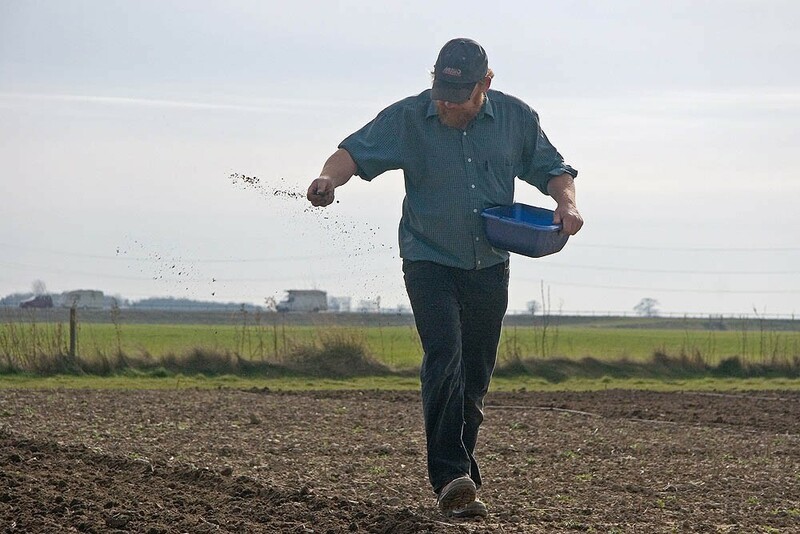 Hand sowing: With practice even quite large areas can be sown by hand (it is often better to take this simple approach than waste time sourcing and calibrating a mechanical distributor). 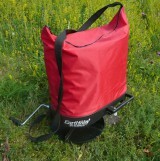 Mechanical distributors such as seed or fertilizer spreaders are good for covering larger areas. If a seed drill is used remove the spouts so that the seed free falls from the hopper and broadcasts on to the soil surface; any coulters or covering tines should be removed or placed out of action. 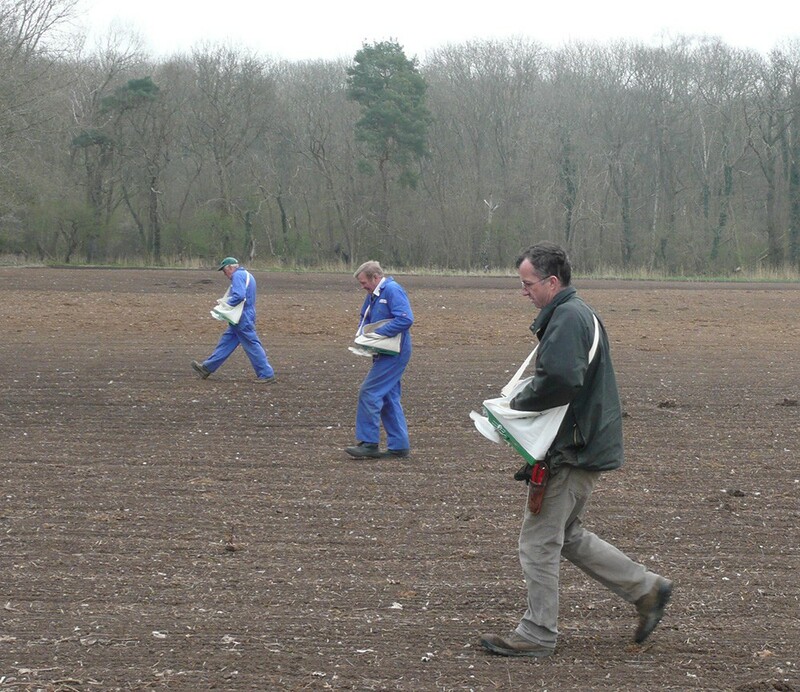 Hydraseeding: specialist contractors have equipment which can apply seed mixed in a liquid slurry. This method is more expensive but works well for slopes and embankments that are difficult to access with conventional equipment. Bulking materials: Sand (damp, not wet and added immediately prior to sowing) is good for hand sowing - the sand will adhere to the seed and aid distribution. Also if the colour of the sand contrasts with your soil it is easier to see where you have been. Sawdust or cornmeal is better for mechanical distributors where sand may cause damage to mechanisms. One or two passes with a roll after sowing will firm and level the surface and create good seed/soil contact. Rolling is most important in dry weather. 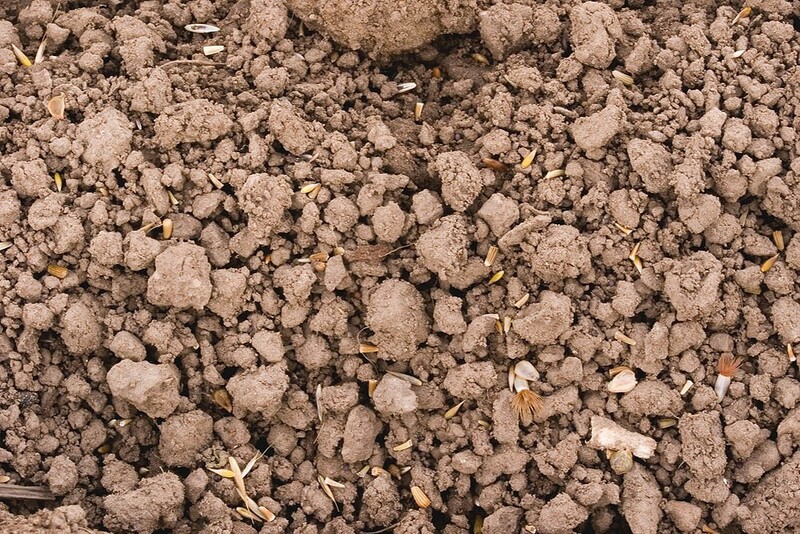 Do not roll when the soil is very wet as this may compact and damage the soil surface. A Cambridge (ribbed) roll is ideal as it leaves a textured surface of small ridges and furrows which is better for soil stability and gives some wind protection to emerging seedlings, especially with autumn/winter sowings. Flat rolls do an adequate job. For awkward or small areas treading with feet works well.